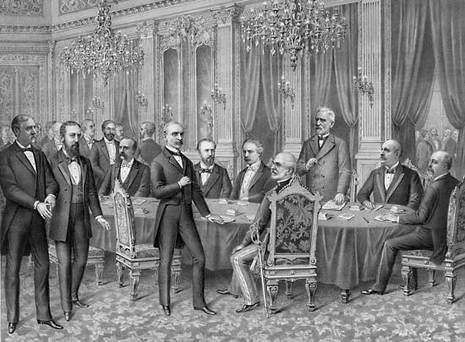 American and Spanish delegates met in Paris on October 1, 1898 to produce a treaty that would bring an end to the war after six months of hostilities. The American commission consisted of William R. Day, Whitelaw Reid, and Senators Cushman K. Davis, William P. Frye, and George Gray. The Spanish commission included the Spanish diplomats Eugenio Montero Ríos, Buenaventura de Abarzuza, José de Garnica, Wenceslao Ramírez de Villa-Urrutia, Rafael Cerero, as well as a French diplomat, Jules Cambon. The Treaty of Paris provided that Cuba would become independent from Spain but the US congress made sure it would be under US control through the Platt Amendment. Specifically, Spain relinquished all claim of sovereignty over and title to Cuba. Upon Cuba's evacuation by Spain, it was to be occupied by the United States, and the United States would assume and discharge any obligations that under international law could result from the fact of its occupation. The major conflict concerned the situation of the Philippines. Spanish commissioners argued that Manila had surrendered after the armistice and therefore the Philippines could not be demanded as a war conquest, but they eventually yielded because they had no other choice, and the U.S. ultimately paid Spain 20 million dollars for possession of the Philippines. The Treaty specified that Spain would cede to the United States the archipelago known as the Philippine Islands, and comprehending the islands lying within a specified line. The controversial treaty was the subject of debate in the United States Senate during the winter of 1898-1899, and it was approved on February 6, 1899 by a vote 57 to 27, only one vote more than the two-thirds majority required. Only 2 Republicans voted against ratification, George Frisbie Hoar of Massachusetts and Eugene Pryor Hale of Maine. * surrendered the Philippines to the United States. The defeat put an end to the Spanish Empire in America and, one year later in the Pacific Ocean (after the German–Spanish Treaty (1899)), and marked the beginning of an age of United States colonial power. , and that the United States hold Manila until the disposition of the Philippines had been determined.